Chalcopyrite is a copper iron sulfide mineral that was first found in 1725 by J.F Henckel. It was named from the Greek word for “Copper” and “Brass”, and can most notably be seen as shades of yellow, green and grey. 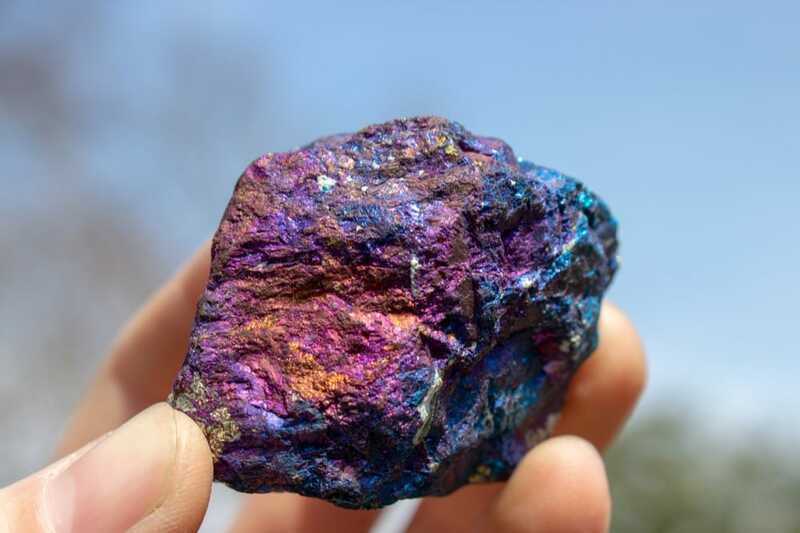 When Chalcopyrite is exposed to acid, its color palette changes to deep purple, blues, violets, and yellows. This treated Chalcopyrite is what you will find at most shows and crystal shops, and is commonly referred to as “Peacock Ore”. Technically “ Peacock Ore” is another mineral called Bornite, which naturally tarnishes to these colors so be careful what your buying! Tarnished Bornite is very rare, that is why you should always check the authenticity when trying to purchase it. 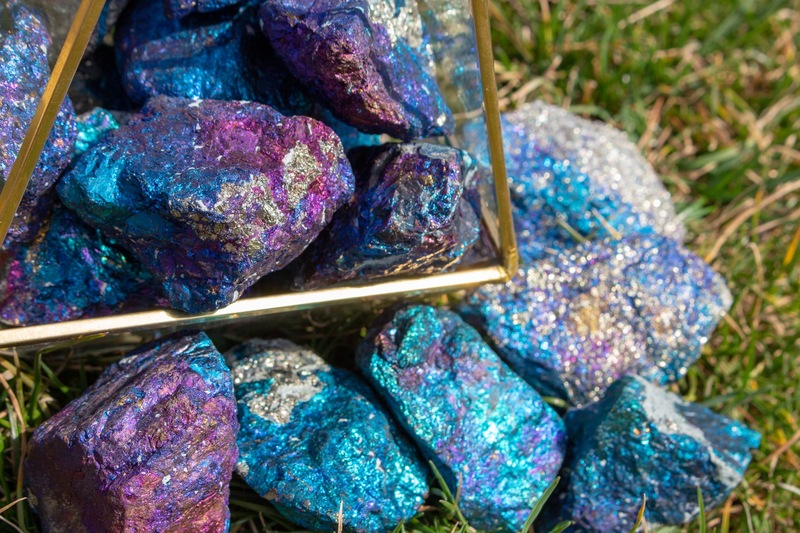 Chalcopyrite is a powerful stone that activates and aligns all chakras. It's a powerful tool that has been used to remove blockages of chakras by shamans and reiki professionals. This stone offers up transformative energies that assist in changing of habits, routines and lifestyles. Working with this stone will help one in finding their own way and life meaning. Carrying this stone daily is ideal for anyone feeling like their “stuck” in the same daily motions and are looking for a sudden change. This stone has always been associated with opportunity and new beginnings, and has been commonly used as a trinket for obtaining luck. Although this stone actives all chakras, it specifically resonates with the higher 3 chakras. Chalcopyrite has been known to expand the mind and open it up to a higher realm. This stone opens our third eye to endless visions when meditating with it, while also using our crown chakra to bridge the gap between physical and spiritual realms. The energies of this stone on the throat chakra specifically help in bringing in this knowledge to the physical. By being able to talk about what you see, feel and hear, you are making it a physical emotion, confirming its reality. That energy can manifest and bring with it positive and life changing opportunities. Chalcopyrite is a very strong meditation tool, and can be assisted by many other stones. Moldavite, for example can help with the transformation energies the Chalcopyrite carries, making a new change in your life just a little easier. Both these stones together will help engage the heart in whatever decision you start making. By activating and listening to your heart, you will be able to make the purest and most appropriate decisions for yourself and well being. When looking to enhance the psychic abilities this stone offers, we recommend using Phenacite, Iceland Spar, Quartz, or even Amethyst. These stones all work on a high vibration and will help in the connection, translation, and understanding of higher knowledge. Be sure to cleanse these enhancing crystals when using them for an extended period of time with Chalcopyrite.